Come and see the wolves in the evening and you’ll experience them in a different light. As the air cools down and the sun starts to set, the wolves get livelier. It is also the best time to hear them howl. When asked how wolves communicate, most people would respond that they howl. However, they actually communicate in a variety of methods through sound, smell and body language. 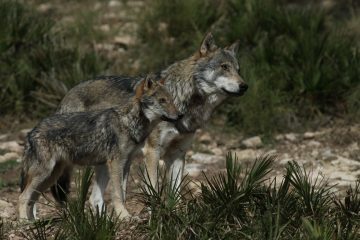 Wolf sounds range from the hair-raising howls that call the pack together and play a huge role in socialisation and bonding, to the rough short bark-like sound that signifies fear and is used to warn other pack members of threats or to scare away intruders. Other sounds include the whine, whimper, yelp, growl and snarl, all of which are probably heard more often than the howl, and yet it’s the howl that defines the wolf and fascinates us. The program starts with some time observing the other animals in the sanctuary and enjoying a small snack on the terrace with the spectacular view of the backend of the El Torcal mountain range. Definitely an unforgettable evening! Prices for the Howl Night: Reservations required! To ensure your reservation, it is necessary making a 50% down payment for your booking (please follow this link). PLEASE NOTE: Customers may re-schedule or refund registrations up to 24 hrs prior to the Howl Night booked at no charge. In the event of a cancellation on our part, we will refund registration fees in full, or the participant can choose to change their reservation to another date.